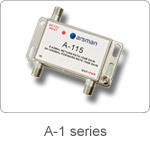 The A-2000 series drop amplifiers are perfectly designed for the current multimedia CATV system. 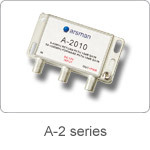 The A-2000 series can forward gain either 10dB or 20dB with the superior flatness. The reverse band of the A-2000 series fits the signals of the two-way communication for phone, fax, cable modems as well as the interactive services from customers. The soldered-back case provides high RFI shielding, guaranteeing clean signals without interference and keeping out unwanted noise.